Our perception of color as we see it in the real world is continuously changing. Color perception is influenced by light source, time of day, atmosphere, form, reflection, and other colors surrounding it. Even digitally, it is impossible to see a particular color without some form of influence interacting with it. It may be the room a monitor is situated in, or even the brightness and saturation of the monitor itself. Color is realized through experience. There are many factors that physically influence the appearance of color, but the most paradoxical one may be our own judgment. Mood is an interesting concept. Illustrators and designers speak about the importance of creating a mood, which is often used to determine a color scheme and individual color choices. With regard to color, the term “mood” can be interpreted from two very paradoxical viewpoints. There is the mood that is intended by the color choices made by an artist in a work of art. This should be referred to as “tone”, although mood is now a more common term for describing an effect in a color scheme. Mood is not only a way to describe a physical state, but it also classifies an emotional one, therein lies the paradox. In other words, we as humans have moods. Moods exert a tremendous influence on our perceptions. To use music as a metaphor, a favorite song may be undesirable to listen to on a particular occasion. The song remains the same, but the mood of the listener may be not be appropriate at that point in time. The mood within a work of art will always be affected by our own emotional mood. Color perception is also affected in the same way. I once conducted an experiment where I asked a classroom of BFA students to identify the color red used by Coca-Cola. They were given six red colors to choose from. After much hemming and hawing, less than 25% of the students guessed the Coca-Cola red, even though they had seen it thousands of times. The impression of color changes for us and by us. A maroon colored shirt one day may appear to give the impression of being more plum colored the next day, even when looked at in the same environmental conditions. In the digital color environment, color is applied in its purist form. All colors can be isolated and defined in mathematical percentages and can be duplicated with complete accuracy. In most cases, digital illustrators and designers select pure colors that are then applied within an image. All colors can be isolated and can be duplicated with complete accuracy. Not withstanding our own perceptual distortions, when it comes to the color artifact itself, colors can be applied consistently. Whereas traditional applied paint is not so precise when it comes to recreating mixed pigments or tints. For example Windsor & Newton manufactures a palette selection of 80 acrylic paint colors. The 80 colors can be mixed to create an endless array of colors, but duplicating any mixture can be extremely difficult. Individual digital color can be chosen from a palette of 16,777,216 distinct color, color can be recorded as swatches or within a style, and duplication is easy. Former Bauhaus instructor and Yale University professor Josef Albers published The Interaction of Color in 1963. The book contained many screen-printed examples of color and perception demonstrations. It essentially influenced the next generation of color theory instruction and was prominently applied well into the 1980’s. Although it is used much less now, the premise of the examples is still applicable, especially in a digital environment and print production. Color always exists within a context, be it on a white background, in a darkened room, or amongst other colors. 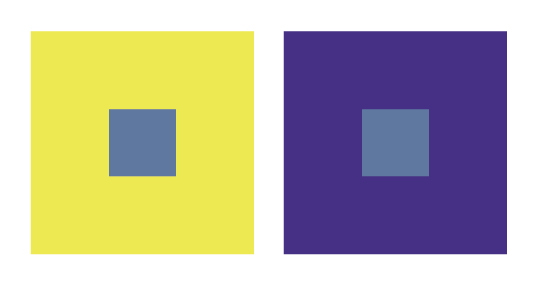 Below are some color perception exercises that were developed along with The Interaction of Color. These exercises will help demonstrate how colors can be perceptibly influenced by their surroundings. They were created in Adobe Illustrator. The colors used in each example are shown using the color picker, not only to show the colors used, but also their value range and relationship to the color spectrum. Due to differences that can occur between monitors, there might be some variances in the colors as they appear in the blog, or on your monitor. Also, web friendly colors were not used for these examples. The small square on the left appears to shift from blue to blue-violet. The colors used are below the examples. 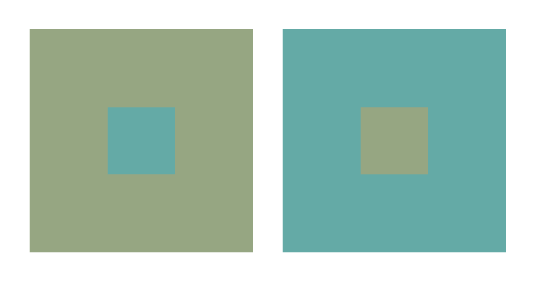 Although they are the same color, the two small squares appear brighter and warmer than their large square counterparts. 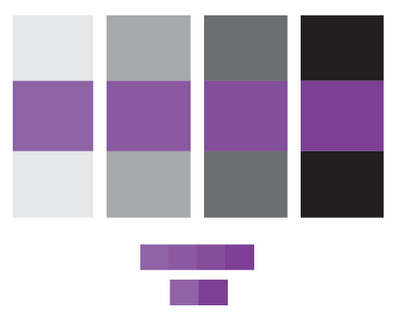 Both violet squares are the same color. 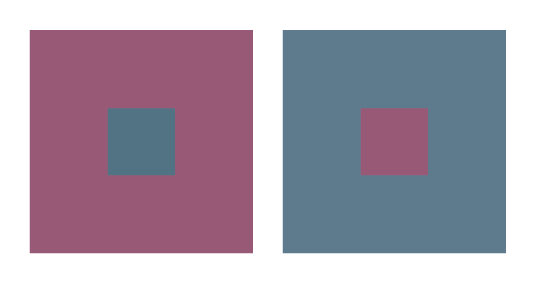 Although appearing the same, the two blues squares are different, the small one is lighter and warmer. The small blue squares are the same color although they appear quite different. Made up of four colors, the large and small blue squares are different colors, as are the large and small blue-green squares. Although different in value and warmth, the two small blue squares appear to match. 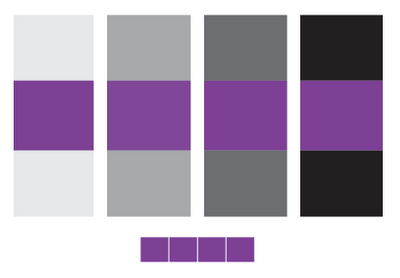 All four violets on the grays panels appear to be the same value. The small bars below show the actual color values. The violet on the far left had to be lightened 31% to appear to match the violet on the far right. 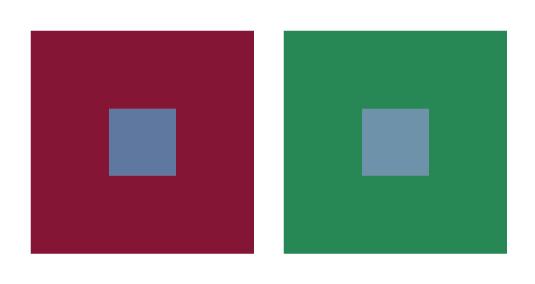 This set of panels shows how the same violet appears to be effected by the background values.